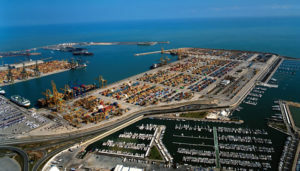 Spain’s leading logistics and port operating group Noatum announced several important changes last week. First, the new management team has arrived in Spain to head Noatum Ports. As we wrote earlier, COSCO Shipping Ports Ltd acquired 51% of Noatum Ports in June 2017. The transaction involved the container terminals in Valencia, Bilbao, Zaragoza and Madrid. Eventually, this has led to the significant change in management of the Spanish port operator. Executive President of Noatum Ports Chris Gray steps down to continue as President of Noatum Maritime, a non-container branch of the Group. The new President of Noatum Ports will be Wei Zhang, currently Executive Director and Vice Chairman of the Board and Managing Director of COSCO SHIPPING Ports Ltd. Besides, he is also an Executive Director and a Deputy General Manager of COSCO SHIPPING Holdings. Wei Zhang joined COSCO Group in 1995. Additionally, Kai Sun, aged 49, was appointed as CEO of Noatum Ports. Sun joined COSCO Group in May 1994 and during more than 20 years in port management and maritime logistics, he held several senior positions, managing, among others, South China Oceangate Container Terminal in Guangzhou (4.78 mln TEU in 2016), Pacific Container Terminal in Quanzhou and Pacific Ports Development in Jinjiang. In 2010-2015 Sun was Chief Operating Officer at COSCO SHIPPING Piraeus Container Terminal, overseeing the rapid growth of the terminal, when its annual throughput increased from 600,000 TEU to over 3 mln TEU. Douglas Schultz, current CEO of Noatum Ports, will retain his functions for some months to support the transition process, acting as an advisor to the new management team. Subsequently, he will continue to be a member of the Board of Noatum Ports and CEO of Noatum Maritime. Besides, Ken Chan, with over 25 years of working experience in corporate strategic planning, management and finance, has been appointed member of the Board of Noatum Ports. Currently he is Deputy Managing Director of COSCO SHIPPING Ports Ltd and is a member of the Risk Management Committee. Earlier in October, Noatum Ports also divested of its shares in Operaciones Portuarias Canarias S.A. (OPCSA), the container terminal at the port of Las Palmas, Canary Islands, which had been left outside the COSCO deal. The 45% in OPCSA remained to be held by the Noatum Ports shareholders. However, now this stake was sold to Terminal Investments Ltd, the terminal division of MSC. With this acquisition TIL, which previously held 55% of OPCSA shares, gains full control of the terminal. Noatum Maritime also had some important news to announce. The company completed the acquisition of the terminals in Barcelona, Malaga, Sagunto and Santander from Noatum Ports, with the aim to strengthen its position as one of the leading multipurpose, Ro-Ro and bulk port operators in Spain. These facilities will be part of Noatum Terminals, one of the 3 business units created earlier this year under Noatum Maritime brand according to their field of activity: Noatum Maritime Services, which includes all the Group’s shipping agency related activities (including Marmedsa), Noatum Logistics and Noatum Terminals. Noatum Maritime also announced of the changes in its management team. Oscar Rodriguez, former Commercial Director at Noatum Ports, was appointed Chief Commercial Officer, being responsible for commercial coordination across the different lines of activities while Noatum Maritime remains under the leadership of Executive Director Antonio Campoy and CEO Douglas Schultz. Noatum Maritime also launched its new website: www.noatummaritime.com, to reflect the Group’s new perimeter, brands and market positioning.